Master planning and architectural services for the modernization and expansion of a K-6 school. Existing buildings were renovated, fixing long-overdue deferred maintenance. The school serves children with disabilities and special needs. The design responds to these requirements with exceptional access, special equipment, and unique spaces. Unlike typical school campuses paved in asphalt, the sprawling campus is park like, with lush lawns, large camphor shade trees and towering ambar trees. The one-story classroom expansion was placed on the south side of the campus, shielding the playground from adjacent townhouses, while forming an attractive, residential-scale edge. 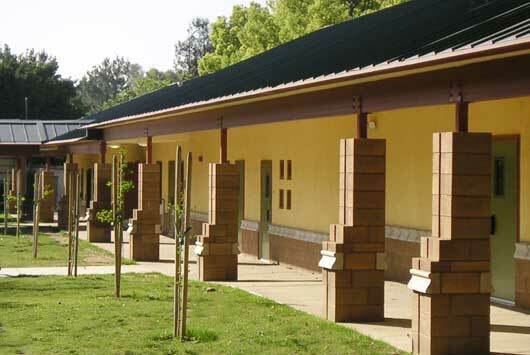 Small, garden-like spaces for sunny, outdoor activities line the back of the classrooms. The special instruction classroom is distinguished with it's round form, projecting into the playground.